Supergirl tells the origin story of Agent Liberty from open minded professor to radicalised anti-alien terrorist. I’ve mentioned in prior reviews that the threat this season isn’t entirely tangible so can’t easily be fought. Agent Liberty is one of the focal points of the larger issue at play but the anti-alien sentiment is systemic so can’t be defeated simply by bringing down one villain. 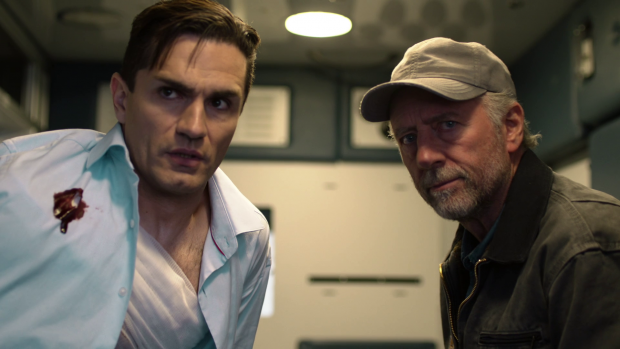 The aim of this episode is to develop that point through the eyes of Benjamin Lockwood (Sam Witwer); a professor who finds himself resenting aliens after suffering some personal hardships. Most of the episode plays out in flashbacks with Ben and his family being introduced around the time of the Alien Amnesty Act. We first see them watching a repeat of the speech Supergirl gave during “Better Angels” to snap people out of the Myriad induced mind control. This scene establishes the baseline and sets the tone for the episode. At this point Ben is entirely open minded and openly disagrees with the anti-alien opinions of his father, Peter (Xander Berkeley) who is quickly losing his livelihood because his steel factory is rapidly losing relevance in a world where Nth metal is a thing that exists. Most people will tell you that the best villains in fiction are those who don’t think they’re villains. It’s much more interesting to watch an oppositional force come out of a difference of opinion, background circumstances that breed a particular way of thinking or anything else that can be understood even if the audience don’t agree with it. There’s no denying that bias exists on this show in terms of the point the writers are trying to make. Bias isn’t always a bad thing unless the mission statement is to present a balanced viewpoint that allows the audience to make up their mind. This episode continues to cement the notion that diversity is a good thing and anyone who doesn’t agree with that is on the wrong side of history. Those who agree with that are the intended audience of that show and those who don’t probably aren’t getting much out of it anyway. the writers are handling what they are trying to do particularly well. Telling the backstory of a man who becomes increasingly more racist as time goes on is a difficult prospect because it could so easily descend into an attempt to make him appear sympathetic though the depiction in this episode is more around understanding what makes him think the way he does rather than encouraging the audience to agree with it. This thin line is walked very well and it will give added depth to Agent Liberty in the coming episodes. Ben is portrayed as a man who somewhat falls from grace. Early on he is championing aliens living on Earth because he sees it as a positive opportunity to learn and grow as a species. He even tries to talk his father into modernising his factory to account for Nth metal because it is clearly the future and his steel only business has been rendered obsolete by this. There have been many examples throughout history of livelihoods being torn apart because of a failure to embrace progress and change. Peter Lockwood is just such a person and early on Ben recognises that though has his opinion changed through exposure to various events. The first such example is when alien workers are attacked at the Nth metal factory and one accidentally injures Ben. When he is being treated he observes Kara -as Supergirl- working with Alex who introduces herself as an FBI agent and sees this as a form of corruption within the system. As far as he’s concerned Supergirl is supposed to be an impartial force for good but working with the FBI makes her corrupt in his eyes and forces him to see the world differently. 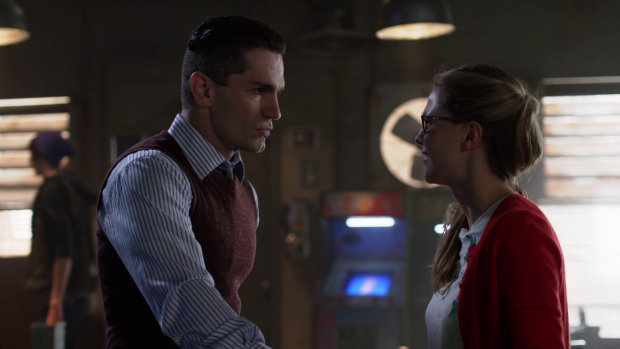 In his mind Supergirl doesn’t have the best interests of those she saves at heart. Another significant point in Ben’s life is when his house is destroyed following a fight between J’Onn and a Daxamite soldier. J’Onn isn’t the least bit concerned with the destruction of the house as he’s satisfied that the occupants are safe so moves on but Ben has lost his home and has witnessed the alien partially responsible in causing that destruction do nothing about it. The audience has the context of J’Onn having larger priorities in the midst of an alien invasion but Ben has more domestic concerns that are more important to him. 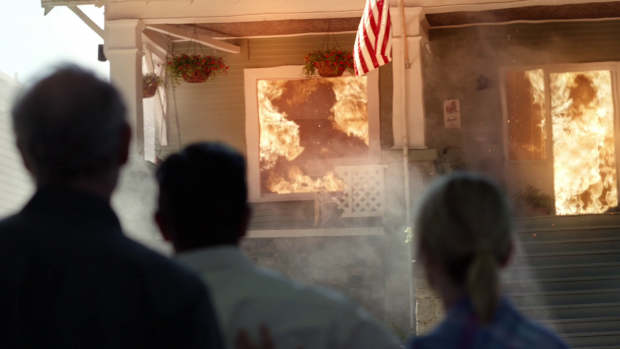 The later reveal that insurance won’t cover destruction by aliens is further reason for Ben to resent aliens. I’ve always been an advocate for off format episodes that explore a perspective that isn’t normally depicted week to week because these diversions often enrich the world that the show belongs to. Ben Lockwood’s perspective is entirely unique as he is adjacent to the big events we’ve seen over the course of the series without being a big part of them. Doctor Who has had some success with episodes that show the Doctor from an alternate perspective and this one offers an interesting look at Supergirl as well as the other characters from the point of view of someone who doesn’t know them as people. It’s easy to see how Kara’s actions could be interpreted a certain way or how James might seem self righteously dismissive of what is really going on in the world from that point of view. The small interactions that Ben has with the main cast vary in quality. I found the James conversation a bit flat because it did make James out to be someone who doesn’t really know what he’s doing which may be accurate considering he was wasting his time as Guardian at that point. The two scenes he shares with Lena are the strongest as she gives him valid and reasonable guidance on what to do next. Their first conversation is where she points out that his father needs to be a good businessman who embraces change and the second she warns him against continuing down this dark path. She even offers her help but Ben is too far gone at this point and isn’t prepared to listen. In his mind he has lost everything and aliens are to blame for that. His interaction with Kara who comes to the aid of one of his former students that he’s harassing by hurling accusations. He assumes that Kara is human because there is nothing obviously alien about her which shows how painfully misguided he is at that point. Kara’s emphatic delivery of “it’s karaoke night” to him asking why she’s in an alien bar is a brief and powerful contrast between Kara and Ben. Kara is a shining example of what it’s like to live without prejudice where Ben is pretty much the opposite by this point. This has them on opposite sides in an ideological sense and there’s plenty to build on here. As strong as this episode is in the main, Ben’s transition from open minded to radicalised xenophobe is far too abrupt. Some of this has to do with condensed storytelling that cuts corners in order to fit this back story into a single episode. Sam Witwer’s performance is excellent and goes a long way towards making this work but there just isn’t enough time for it to feel as organic as it needs to. This makes otherwise great scenes like him addressing a class that contains aliens about how terrible aliens are feel somewhat out of place as it doesn’t feel fully earned by this point. There are two of these scenes with both accomplishing the very same thing though they act as checkpoints on his descent into villainy. The first is when he is still able to articulate himself rationally around how progress usually means that someone loses something and the second is unbridled lunacy that causes his students to be so terrified of his opinions that they walk out and later report him. Seeing more of what happened in-between would have likely strengthened the overall quality. It might have been better had an Arrow style approach to Agent Liberty’s origin been taken with flashbacks spanning multiple episodes to properly flesh out his descent into all out villainy. The episode also fails to make clear what makes Ben more significant than any other alien hater in the world. He spreads his message through talking to people and handing out pamphlets. He also apparently attacks and kills aliens but there isn’t much evidence of that in the episode itself nor is there any real evidence of the “rare gift of communication” in the same league as Roosevelt or Mussolini. The lack of time to develop any of this means that the episode does a lot of telling and not showing which ultimately weakens the overall characterisation and makes it difficult to accept the shift in this character. Once again, Sam Witwer’s performance is excellent but the writing really needed to compliment that. One thing I’d like to see explored is how much of a hypocrite he clearly is. One of his gripes is that the image inducer allows aliens to move among Humans unnoticed so it seems he has some sort of issue with people being upfront. This makes his decision to wear a mask really bizarre as he is basically doing the same thing though that’s not necessarily a bad thing if the show goes down the route of establishing him as a dictator who fails to live up to his own standards. It could form part of his downfall once he sees himself for what he really is. With this being an off format episode there is very little time spent on developing the main cast which is definitely the right thing to do in order to give Ben the necessary time to become known to the audience. 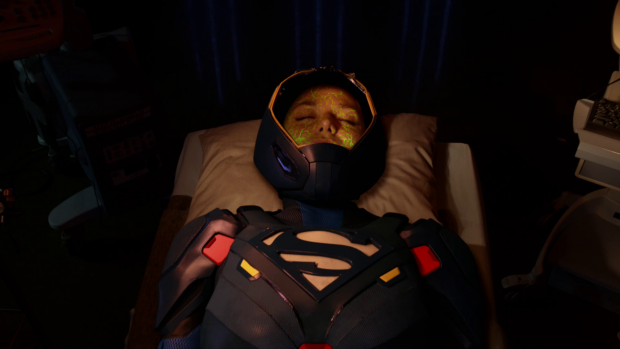 There is a significant threat to Kara now that the atmosphere has been seeded with Kryptonite which puts her out of commission for a while. There is a temporary fix thanks to Lena’s body covering suit that will protect her. This creates a natural excuse for Melissa Benoist’s absence while she was pursuing a stint on Broadway in real life while creating opportunities for other characters to shine. A strong episode that abandons the traditional format in favour of helping the viewer understand Agent Liberty and his motivations. Chronicling his descent into villainy by showing his connection to major events since the end of season 1 is a strong touch as it fleshes out the world the show belongs to by showing a unique perspective. The viewer know why certain things happen but Ben is a man who loses his house, feels abandoned by a government that seems to favour the needs of aliens over him and is desperate to have his voice heard. The episode walks the thin line between understanding and sympathy really well. Audiences aren’t supposed to agree with Ben because his opinions are so counter to the general ethos of Kara and the show as a whole but by the end of the episode there is at least a better degree of understanding as to what he stands for. Where the episode falls down is in the general execution of this. 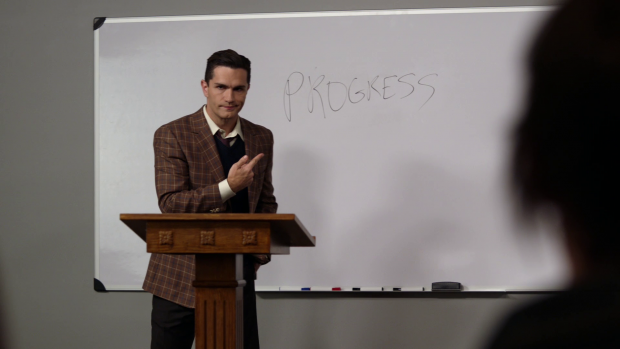 Ben’s transition from open minded professor to extremist is jarring because there isn’t enough time in the episode to show this in its entirety. Sam Witwer’s performance is excellent but the writing really needed to back him up on this. Since his ability to rally people to his cause and the actions he takes against aliens aren’t shown it’s difficult to fully accept. I do applaud the writers from diverting from the usual format of the show and expanding the world through alternate perspectives but it might have been better to show this transition over the course of multiple episodes.